Snorkeling in Hanauma Bay is an amazing experience. And you do not have to be a professional diver to enjoy the underwater world. You just need a mask, snorkel and fins! Depending on the water temperature, you may also need to wear a neoprene suit if it is too cold. Otherwise, your swimsuit will suffice. However, there are some basic safety rules that must be respected. 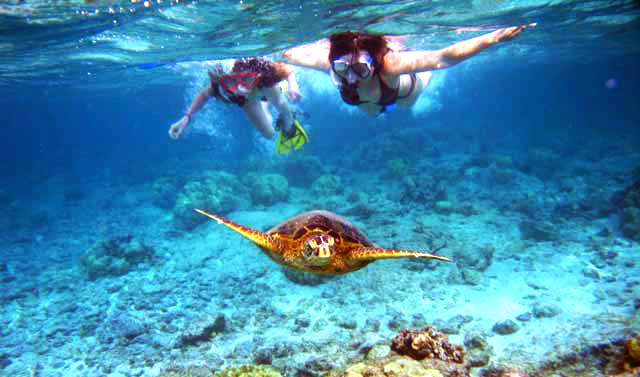 Snorkeling is a good start to start your adventure. This is your chance to get to know a new and incredible world. It is suitable for all ages and provides both active movement and relaxation. Make sure your mask is tight, but not too tight. Water pressure will also help the mask stay on your face. 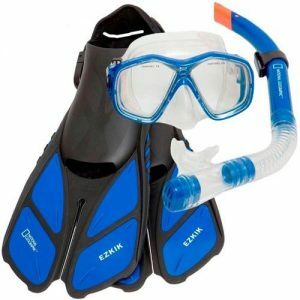 The strap of the mask should be around the widest part of the head, and the snorkel should rest in the front of your ear. Getting the first breaths out of the snorkel can take some time, like swimming with fins. Remember that by diving underwater, your snorkel will be filled with water and you must keep your mouth closed. Once you get on the water surface, you can blow out the snorkel water or simply remove it. If you have never dove before with fins, you will be surprised at how little effort you can have and get to an enviable distance under the water. Your fins should fit snugly but not too much because it can damage your feet and cause cramps. They should not be big enough to get rid of your legs and sink. When walking with them, do not forget to raise your legs higher so you will not lose your balance. It is not that you can’t put your feet in the water, but If you want to see more things you have to be sure in your swimming skills. Snorkeling is not a joke and if you go deeper, you should be aware of undercurrents and other hazards. If this is your first time snorkeling, you can do a few lessons in shallow waters. You can learn under the guidance of a friend who is experienced, but if you do not have such, you can always sign up for a snorkeling course. Do not dive alone no matter what a professional you think you are. Even the best divers drown. Leave the high self-esteem for some other time. It is mandatory to dive with a friend. So if you find yourself in a stream or there is some other trouble, your friend will be able to help you. Most accidents happen to divers who dive on their own. There is something else. You always have to choose the more experienced one of you as a leader. The leader must be listened – if he says “Get out of the water”, you go out, if he makes a stop sign, you stop. No mumbling, no pretensions! In deeper waters your heart can beat fast and you can get the feeling that you sweat. It can be scary. When you’re in deep waters do not let your fears to emerge. Even if you find yourself in an emergency – a current, waves or you get a cramp, try to remain calm, breathе and take it easy. If you remain calm, everything will be fine. Plan so that you can return to shore without a problem. When you snorkel you forget about the world and you may go far away in search of new or underwater landscapes, or try to dive among a shoal of fish. There is a danger to hardly return to the place from which you started. It is important to have proper assessment of your physical endurance and to plan your dives so that you do not have to exhaust completely. If you get exhausted in the water, you will become too weak to deal with underwater currents or cramps. It is good to have preliminary information and plan. It will be much more interesting if you know what to look for. Also consider what kind of sea creatures you can see, what sights there are underwater – niches, caves and reefs. Ask locals or those who know the area in which you are diving, what possible dangers there are – currents, passing boats, jet skis or other. Ask yourself where are the convenient approaches for entry into the water. When snorkeling in Hanauma Bay, you must have one thing in mind. Most animals do not think you are a threat, but there are certain species that are poisonous, stinging and biting. So the best for you is just to watch and do not touch anything. Dealing with some fish, jellyfish from those who swim in the Pacific, can be fatal, if you try to touch them. And at last but not least, if you do not have reef shoes, buy some. Meeting with sea creature like sea urchins or sharp corals is not particularly pleasant. Have a clear idea of the place where you are heading to. Be aware of your physical and swimming abilities.